Nabisco originally released the saltine cracker in 1876. Their slogan for this new type of cracker was “Polly wants a cracker?”, which is where that saying came from. 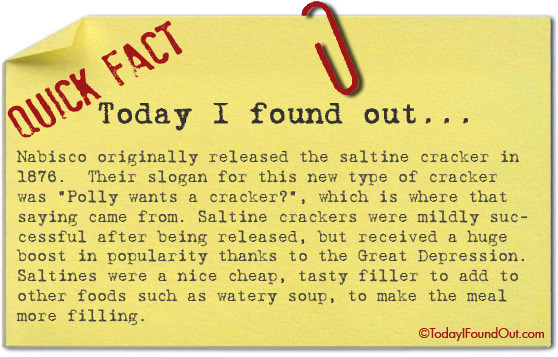 Saltine crackers were mildly successful after being released, but received a huge boost in popularity thanks to the Great Depression. Saltines were a nice cheap, tasty filler to add to other foods such as watery soup, to make the meal more filling. Hello… Who was Polly? You explained the cracker part, but what about Polly??? @Bill: Presumably a parrot, though I couldn’t verify that anywhere. I wondered about this phrase a while back and tracked down the word “Polly” to the OED…. According to the Oxford English Dictionary (OED), Polly is a diminutive of Poll “as a female name, and name for a parrot,” and Poll, altered from Moll, familiar form of Mary, is the traditional name for any parrot. Probably the phrase came from people asking their parrot if it wanted a cracker, and then the parrot mimicking the words back in ‘parrot speak’. @Martin: Interesting. What is the source of that image specifically? If it truly predates it then Nabisco perhaps simply borrowed it for their ad campaigns, whether knowingly or not.